Navigating Tricky Crosscurrents In Russia's Heartland The contradictions of today's Russia are evident along the banks of the Volga River. In the post-Soviet world, personal freedoms, unshackled capitalism and the paradox of Vladimir Putin's centralized state controls run on a parallel course. The newly renovated Mikhail Bulgakov cruise ship has four tiers and offers a variety of amenities to mostly Russian vacationers. The captain of the Mikhail Bulgakov, Pavel Kositsky, says he's proud of his ship and hopes tourism along the Volga will increase. 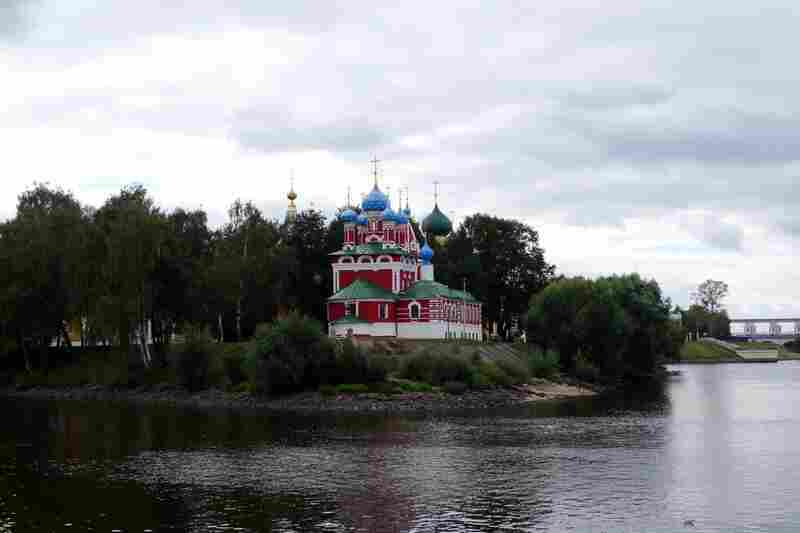 A day after leaving Moscow, travelers can see colorful churches along the forested banks of the Volga. Ksenya Svetlova and her new husband decided to honeymoon down the Volga even though it's more expensive than a trip to Spain. A variety of activities are offered onboard, including dance lessons. At one of the many port stops, travelers can purchase a variety of goods, like smoked fish, from locals. Fishing camps line the banks of the Volga River. 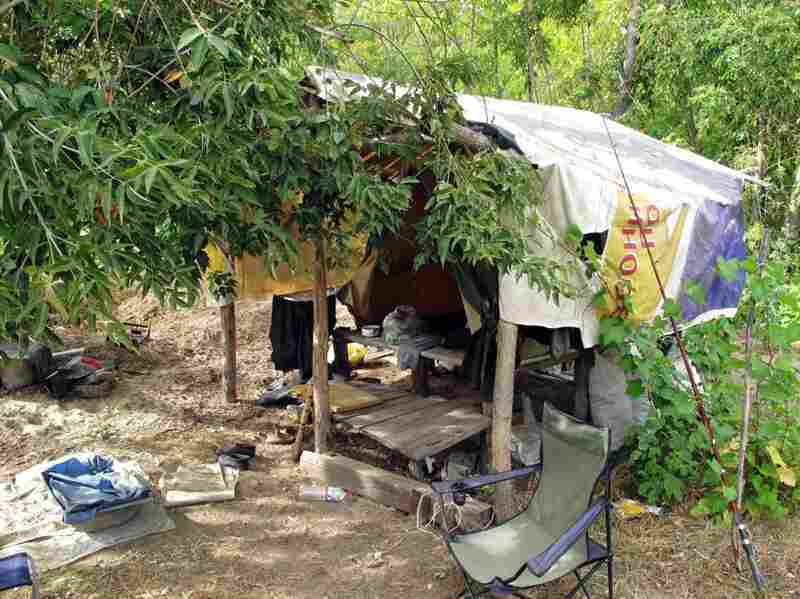 Gennady Anatolievich, 70, and his wife live here for six months out of the year. 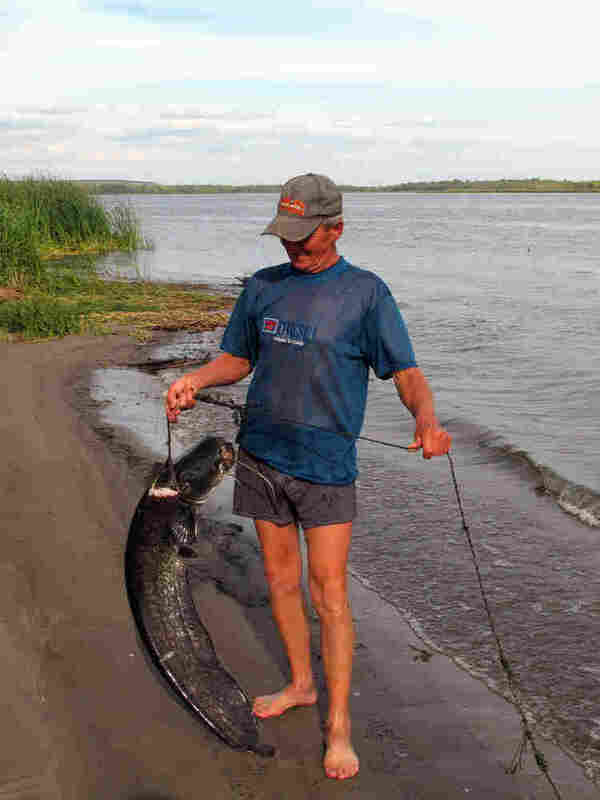 Anatolievich shows off a prize carp at his fishing camp in Usovka on the Volga. 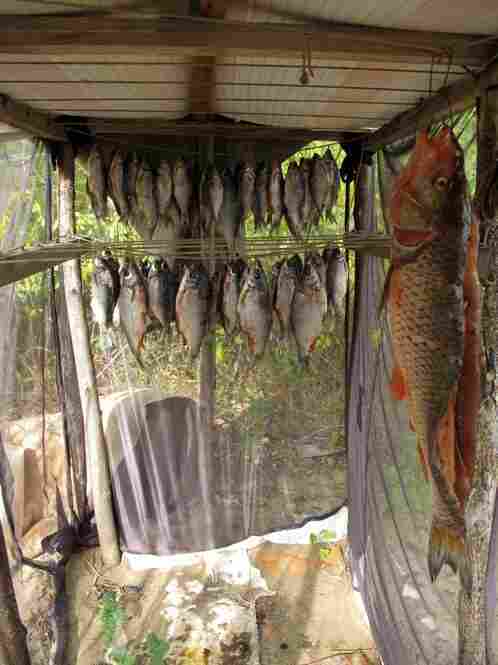 Anatolievich hangs his fish to dry before smoking his catch over a wood fire. 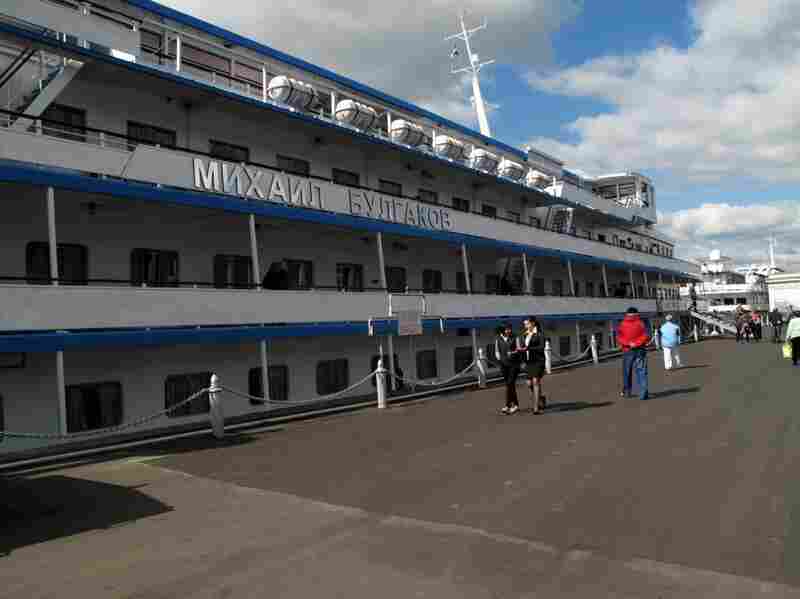 On a recent day in Moscow, a newly revamped four-tier cruise ship named the Mikhail Bulgakov departs amid rousing music and much fanfare to ply the Moskva and Volga rivers. Named after a brilliant Soviet writer whose work was banned, the ship pulls out next to another passenger ship, the Felix Dzerzhinsky. He founded the KGB, and was the man who, on orders from Josef Stalin, silenced Bulgakov. This bizarre juxtaposition seems to sum up the contradictions and conundrums still so evident in today's Russia. In the post-Soviet world, personal freedoms, unshackled capitalism and the paradox of Vladimir Putin's centralized state controls seem to run on a parallel course. And Russians are still trying to come to terms with their history. A constant in the country's turbulent history is the Volga River, which courses through a vast territory of European Russia and helps define its people. The cruise ship Mikhail Bulgakov moves north through the Moscow Canal for 80 miles before reaching the Volga. Along the low-forested banks, freshly gilded domes of churches peek out through the trees, glistening as the sun goes down. The appearance of new mansions startles passengers, inciting discussions about corruption and architectural taste in post-Soviet Russia. 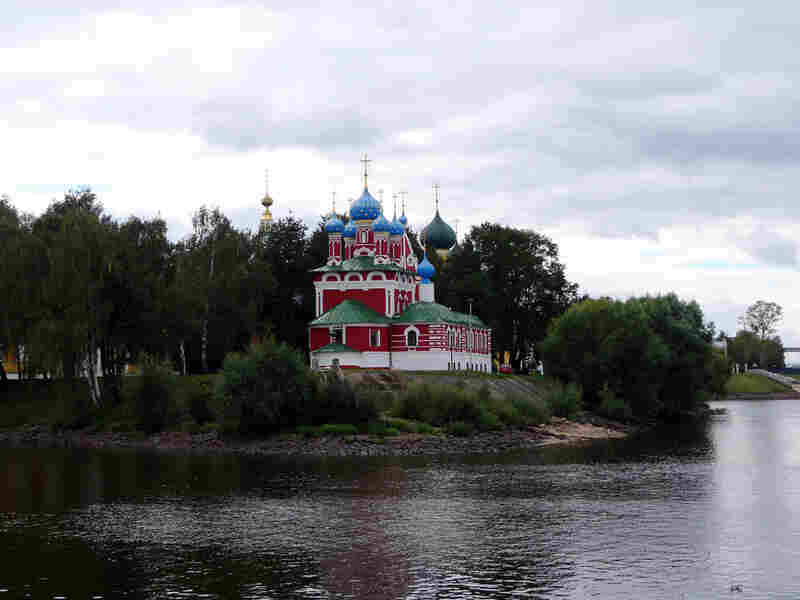 A day after leaving Moscow, travelers can see colorful churches along the forested banks of the Volga. They share the banks with mansions of Russia's nouveau riche. The Volga's historic cities, which had become shabby, are being transformed. It's nothing as quick as Moscow's explosion of wealth, but in the town of Uglich, founded in the 10th century, guide Igor Kozlov proudly describes the latest tourism efforts. "Russian towns are remaking themselves so that they are comfortable. There's a lot of restoration," he says. Farther south, the emphasis is on new development. In the city of Samara, where oil is king, guide Nina Borisovna complains about a land grab gone mad at the expense of architectural treasures. "In my courtyard, for example, there is a building for which there is no permit. It's a phantom. Officially, it doesn't exist. With so much money to be made in new construction, the authorities have destroyed many beautiful buildings. New construction in the city center is intense. No parking, the traffic is terrible," she says. One thing that is untouched there is Stalin's bunker -- seven floors below ground. It was built in Samara so Stalin could flee there, had Moscow fallen to the Germans during World War II. Its existence was only made public in 1991. Should tourists wish, they can be photographed wearing a copy of one of Stalin's uniforms. This gives Borisovna the creeps. Still, she laments the absence of foreign tourists. It is a view echoed by Sergei Shpilko, president of the Russian Tourism Union. He says Russia is too expensive and too difficult to visit. It is cumbersome to apply for a visa and, once in Russia, travel is too difficult because of poor roads and uneven service. In a country of rich history and stunning national parks, he wishes the government would do more to advertise the country's attractions and encourage investment in tourism. The government has focused on oil and gas, while ignoring the needs of other industries, he complains. "For such a large country with such potential, a mere 2.1 million foreign tourists a year is embarrassing. The number hasn't grown in over a decade. And 80 percent of those who do come here only go to Moscow and St. Petersburg," Shpilko says. Even for Russians, their homeland is a more expensive vacation destination than places like Turkey or Egypt. But more and more Russians of means are choosing to travel at home, and the Volga is one of their favorite destinations. But there still aren't many passenger ships plying its waters. 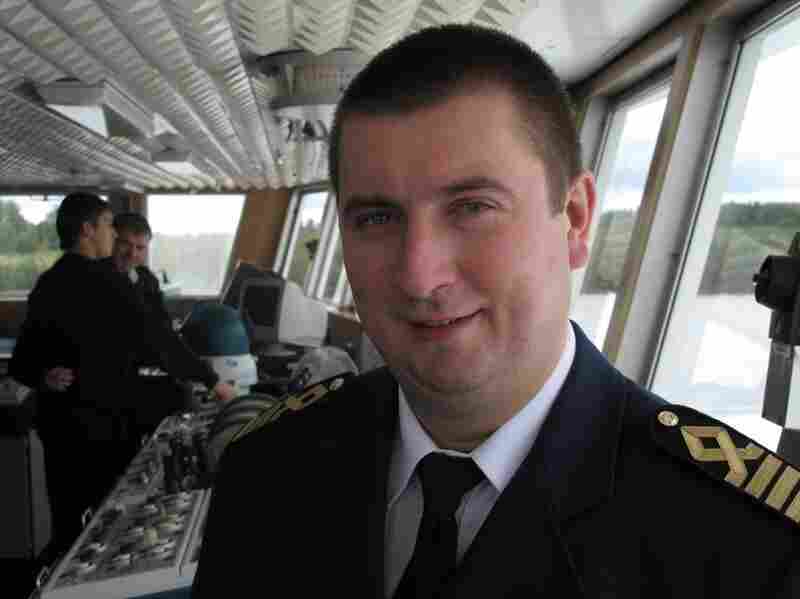 Standing on the observation deck of the Mikhail Bulgakov, the boat's 31-year-old captain, Pavel Kositsky, wants to see more ships. "The level of tourism is improving. Maybe because people have been to Europe and seen what is good, and are now demanding it here," he says. But the cruise ships in operation were built more than 30 years ago when the Soviet Union had advantageous deals with Eastern European partners. Building new ships now is a pricey proposition. The 225 passengers aboard the Mikhail Bulgakov are Russia's new middle class -- professionals who can plunk down at least $1,500 per person for the nine-day cruise. For the average Russian, whose monthly wage is about $500, that's a stretch. Ksenya Svetlova, 30, and her banker husband are on their honeymoon. The Volga cruise costs three times more than a tour to Spain, but for this special occasion, the couple decided to splurge in order to see this special part of their homeland. Svetlova says the typical package trip to a foreign beach resort is now "banal." She says she is generally happy with the Volga cruise, though a little disappointed that the advertised onboard spa does not, in fact, exist. For the most part, though, it's a full cruise ship menu: late-night dancing or a more restrained classical concert, classes in Russian folk art and yoga, as well as lectures on the Volga. There are also raucous sessions of a popular parlor game called Mafia. And between all of this and some hefty dining and drinking, there's the daily whirlwind tour of one of the Volga cities. On one afternoon, the ship stops at a wooded island near the city of Saratov, about 500 miles southeast of Moscow. The beach is covered in trash. 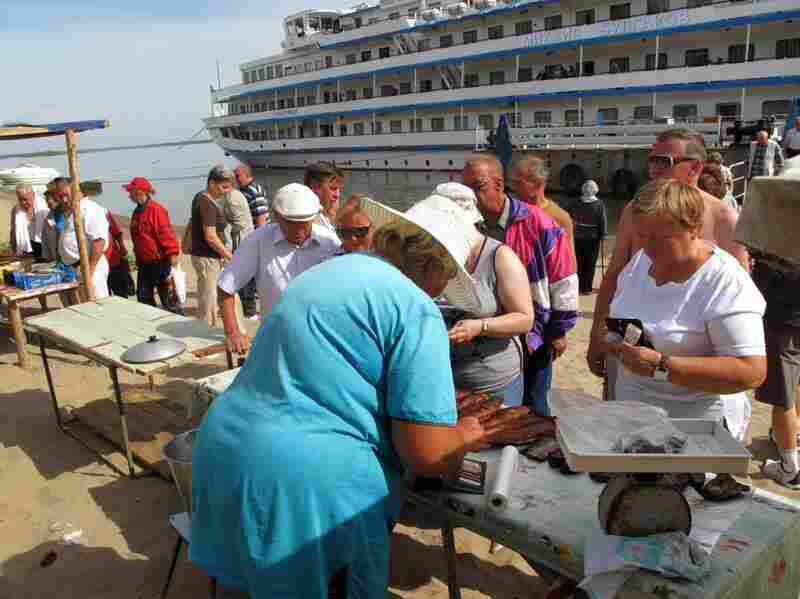 But locals greet passengers with a selection of Volga delicacies. One fisherman, Gennady Anatolievich, says you can tell the water is getting cleaner because the crabs have returned. "In the past, the military plants would dump huge amounts of poison in the river," he says. Saratov, a military industrial center, was off limits to foreigners in the Soviet era and has struggled to cope in the new era of private enterprise. Anatolievich, 70, is stunned to see an American among the ship's passengers, and delighted to take off on an unofficial tour of the area. His children are thriving in the economy of the new Russia, but he's struggling on a monthly pension of a couple of hundred dollars a month. 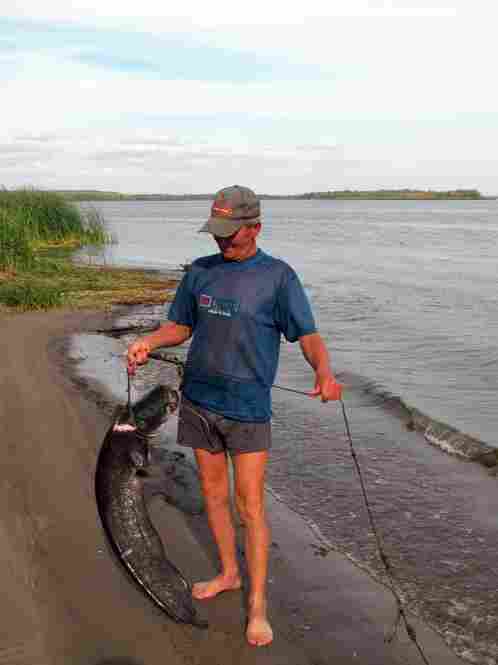 To make extra money, he and his wife sell their catch of perch, pike, carp bream and crab. For six months, when the river isn't frozen, they live in makeshift tents on the Volga shore, smoking their fish over a wood fire. It's a basic but cozy setup -- a well-tended vegetable garden and wild mushrooms add variety to their diet. Weekend homes of the new middle class are sprouting along the river. Anatolievich says that beyond some trees, there's even a private airstrip catering to the Moscow rich. When asked how Anatolievich has the right to set up camp, he replies with lots of "ums" and "ahs." It seems he has friends in the right place, so he doesn't worry about being evicted, or concerns like the legal limits on how many fish an angler can catch. As ever, personal connections or payments under the table allow Russians to skirt the rules. With a twinkle, he simply says, "I have an agreement." Wednesday: The once-closed city of Saratov searches for its place in post-Soviet Russia.